You know, Apple could have convinced me to give their machines a go (albeit removing OS X for Vista) had they engineered the MacBook Air correctly. Instead, they produced a glorified PDA (aka UMPC) that really isn’t all that useful. After the specs first starting appearing on the keynote feeds, I immediately thought of the Sony X505 which I previously had drooled over. Indeed, Sony noticed the parallel too. Anyway, I do own a ThinkPad X40 which is a pound lighter than the MacBook Air, has a removable battery (with multiple options and with the UltraBase, up to 11 hours on one go) has a reasonable amount of USB ports, does not require any dongles to use, a PCMCIA slot, an Ethernet port and a full set of accessories including an external optical drive or snap-on UltraBase containing another battery, hard drive and optical drive. Additionally, you get a very nice warranty that doesn’t require you make appointments and drive an hour to the nearest "genius bar" for assistance — instead Lenovo sends you the necessary parts overnight on a 24/7 toll-free line with little hassle (yes, personal experience). Oh, did I mention it was $700 cheaper? 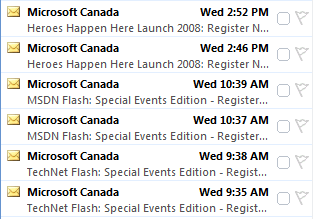 I really think Microsoft Canada wants me to register for their Heroes Happen Here Launch. Just to clarify, they’re sending it to two of my e-mail addresses they have on file (which is why it’s doubled up) and to three of their newsletters. Unfortunately I can’t stop the doubling of e-mails very easily. I’m unable to unsubscribe from the old address since it’s not connected to a Live ID and simply got pushed through the system over the years. Yes I could unsubscribe from my newest Live ID connected address, but I prefer it to go to that e-mail. Still, it really would be great if they could merge their lists together and have one single launch e-mail. I don’t believe I’m going either, the Vista launch was rather a bore, never mind how Shawn and I almost were kicked out due to age requirements last time. Happy New Year and cheers to new (and hopefully) better Messenger releases, good friends and prosperity! On a personal note, I think this year will be much different than the last. I can just feel it.